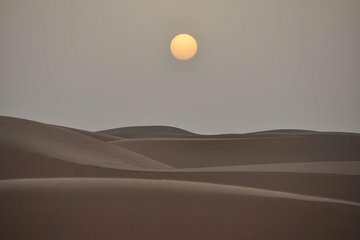 Experience the full magic of the desert, from ancient customs to the latest outdoor sports, on this 6-hour family-friendly desert experience from Dubai, including a barbecue dinner. Feel your adrenaline race on a 4x4 dune drive with a trained driver, try sandboarding, ride a camel and if you wish, get a henna tattoo on your hands or feet. Lastly, sit down at a starlit desert camp for a mouth-watering buffet dinner and live barbecue, and enjoy live entertainment including mesmerizing whirling-dervish ‘tanoura’ and belly dancing shows. A nice trip out to the desert,always easier getting picked up and dropped off at your hotel.Always a stop somewhere where they try and rip you off with expensive drinks or ice creams,the sand dunes were amazing in the 4x4,but a woman in the back of the jeep felt sick so the driver had to take it easy which spoiled our enjoyment.When you arrive at the venue some of the things are free but you can tell the difference if you want to pay extra,the camel ride is about 20yards,the woman at the Arabian costume wasn't interested when I said I wanted the freebie and just showed me the White robe,a bottle of whine was 70,the coffee and soft drinks are free.The entertainment and food was all ok.Worth doing this tour just for the Dune bashing but make sure the people with you are ok getting thrown about a bit. Tour was excellent. The dune bashing and fire show were definitely the highlight of the tour. This was amazing ! Well organised tour lived every minute of it ! vraiment super sympa, chauffeur prive, traversée dans les dunes a fond la caisse trop fun spectacle magnifique, dommage que le tour de chameau soit si court. merci pour se merveilleux moment. Our tour was great and our guide Jaued was absolutely awesome! He allowed us to take our time and we never felt rushed and he was very attentive to my Fiancé who was taking forever at every stop. I would definitely refer this co. Especially you should request the guide Jaued. I would not recommend this tour to anyone! First of all we were picked up by a guy who has lived in Dubai for over 10 years yet knew nothing about the city or the culture. He also made it very clear that he was not interested in having a conversation with us or answering any of our questions. Then when we got close to the dunes he quickly pulled the vehicle over on the side of the road and told us to switch cars for our dune bashing. It was all done very quickly, with little to no instruction on what was happening and why all of a sudden we were with a different driver in a different vehicle. The add promised 30 to 45 minutes of dune bashing but we were told our turn was up and to get out of the vehicle with less than 15 minutes of dune bashing. The add also promised sand boarding however there was none. Additionally the add promised snacks and dates along with free beverages but there were no snacks or dates served and the free drinks were only allowed after 6:30pm. The free option to try on traditional Arabic clothing for pictures was pathetic! They only had 2 outfits for 500 people to share and then you had to pay for everything else. It was extremely un-organized and likely done that way to encourage people to speed things up by paying for the nicer outfits. We complained to a manager about no sand boarding and we were assured sand boarding would take place before the evening was over yet it was never followed through on. Sand boarding and 30 to 45 minutes of dune bashing were the ONLY reason we booked this particular tour and neither of those took place. We left feeling like we spent a lot of money for a product that was not delivered on and without an apology or explanation for any of it. Do not waste your time or money on booking this tour.